Quick-Snap 5-Pack Sprinkler Kit [Quick-Snap 5-Pack Sprinkler Kit] - $199.95 : NewDaVincis.com!, Great Innovative Products, Gadgets and more. 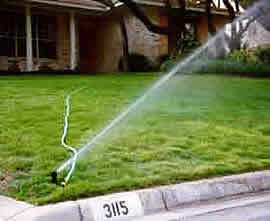 Stand-alone, pop-up sprinklers buried in your yard, without underground pipes. The 5-Pack contains 5 Quick-Snap Sprinklers, 5 hose connectors and 3 "Y" connectors. It offers a greater combination of coverage options for both front and back lawns.Â Their spray can cover squares and rectangles from edge to edge. Each connector has its own shutoff valve. 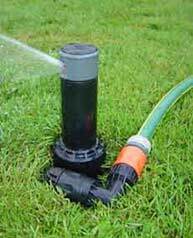 The valve can be used to reduce throw distance or save a trip back to the faucet.